Programma 2 juli 2014 Aanvang 20:00h De deur sluit na aanvang! Lokatie Framer Framed in de Tolhuistuin IJpromenade 2 Amsterdam Route Bereikbaar vanaf Amsterdam Centraal Station met het pontje ‘Buiksloterweg’. De entree van het gebouw ligt direct aan het fietspad langs het IJ. 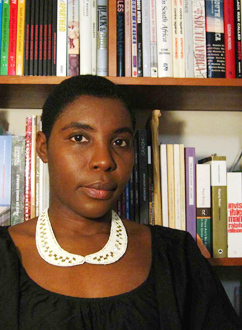 Framer Framed is honoured to host Christine Eyene as a visiting curator in 2015. In preparation Christine Eyene will be giving a presentation on her groundbreaking work as curator and as researcher. We invite you to come listen to her presentation and partcipate in our discussion on curatorial practices. Framer Framed appreciates your feedback on the planned exhibition by Christine Eyene at our gallery as we want to make this process as inclusive as possible. In this lecture, Christine Eyene will introduce elements of her research and curatorial practice dealing with the body in contemporary art from Africa and the Diaspora. 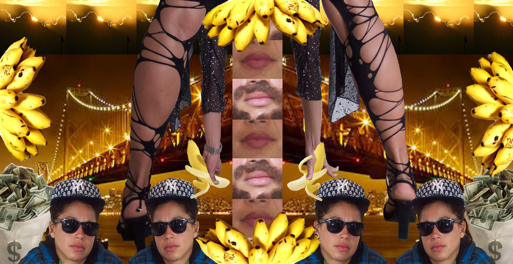 Using iconography as an analytical tool to apprehend the human figure, Eyene will look at how visual artists redefine the racialized or gendered body in order to develop personal or collective narratives, challenge stereotypical imagery, and contribute creating new visual idioms and icons. Eyene will also give an overview of Making Histories Visible, an archive and interdisciplinary visual art research project based at the Centre for Contemporary Art, University of Central Lancashire. The archive contains historical material relating to Black art practice in the UK from the 1980s, a movement that has been influential in the curator’s critical approach. Will also be evoked projects addressing the dual condition of invisibility and visibility of non-western art in mainstream institutions, through the example of the exhibition WHERE WE’RE AT! Other voices on gender recently opened at Bozar, Brussels, as part of the Summer of Photography 2014, international biennial of photography and lens-based media. Christine Eyene is Guild Research Fellow in Contemporary Art at the University of Central Lancashire. She contributes to the project Making Histories Visible led by Professor Lubaina Himid MBE in collaboration with Susan Walsh, Research Fellow Contemporary Art. She recently curated WHERE WE’RE AT! Other voices on gender, BOZAR, Brussels (June 18-Aug 31, 2014); George Hallett: Consigned for Future Memory, PR1 Gallery, University of Central Lancashire (March-April 2014). Her forthcoming exhibitions include the touring of La Parole aux Femmes, Fondation Blachère, Apt, France, and Basket Case II, National Gallery of Zimbabwe, Harare (both October 2014). Previous international projects include: Thierry Geoffroy: Mobile Emergency Room in the Zimbabwe Pavilion curated by Raphael Chikukwa at the 54th Venice Biennale, Venice, Italy (June-Oct 2013); 10th Dak’Art Biennale, Dakar, Senegal (May-June 2012); 3rd Photoquai: Biennial of World Images, Paris, France (Sept-Nov 2011).